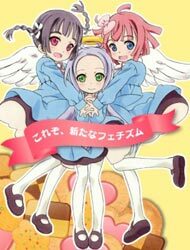 Plot Summary: Botan Ichige has just enrolled in St. Asmaria All-Girl's School where angels are said to live. It turns out that angels do indeed live there, and after an accident, an angel named Un offers Botan her halo as a snack. After eating it, Botan discovers it had some bizarre side-effects, causing her to regularly "give birth" to colorful mushrooms. Is this the life of an angel! ?